George the Cyclist: "Cyclogeography: Journeys of a London Bicycle Courier"
"Cyclogeography: Journeys of a London Bicycle Courier"
Jon Day loved being a bicycle messenger, "every moment of it." After being on the job for a year, he began to wonder if he should make it his life's work rather than just an interlude between university courses while he tried to decide what to do with his life. He stuck with it for another two years, finally extricating himself to become a lecturer at Kings College in London and free lance writer for the London Review of Books and others. 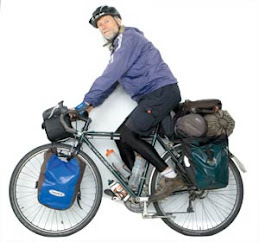 He recounts his stint as a messenger, while also pondering the might and majesty of the bicycle, in "Cyclogeopraphy," a seven-part essay, published as a pocket-sized 160-page book. He doesn't dwell much on his addiction and his dilemma of whether to give himself up to it or to do something more socially acceptable. Instead, he mostly meditates on his privileged position of being able to roam the city on his bike and to have his thought focused on others who have placed the bicycle on an altar--H. G. Wells, Henry Miller, William Saroyan, Paul Fernel, Tim Krabbe, Vittorio De Sica and others. He even searches out Fernel for a chat when he's in London and drops in on noted author Iain Sinclair, who specializes in psychogeography and is an authority on gadding about. He never uses the word addict, but he portrays many of its symptoms. The job became all-consuming, so much so that he began to feel better on the bike than off it. He doesn't quite reach the level of addiction that I did during my eighteen years of bliss as a messenger, of dreading those words from my dispatcher at the end of the day that there was no more work and to go home. I never wanted my day of rocketing around the city delivering parcels to end, not out of greed, as I was paid by the delivery, but out of the craving to keep the endorphins surging that had me in a state of peak exhilaration. While Day feared becoming a decrepit older messenger, I looked forward to being a fifty-year old messenger doing as many deliveries a day as my age, just as golfers who cross into their seventies anticipate the challenge of shooting their age. And then when I reached fifty, I looked forward to turning sixty and still being at it. Unfortunately, I fell a few years short of that second goal, as the industry dwindled to the point that I could no longer continue to come and go as I pleased. One year when I returned from another several month absence of biking around Europe and following The Tour de France, I was told I would have to commit to being full-time and not going off for months at a time when the whim struck. In its heyday the company I worked for my entire career employed sixty messengers and four dispatchers (known as controllers on the other side of the pond). It was down to less than a dozen riders with just one guy dispensing orders. I had to make a decision of whether to make the messengering my entire life, as was surely tempting, or continue to maintain my free and footloose existence. I had been diligent about saving and investing. I had reached the point where I was doing the work because it was fun, not because I needed to pile up more dollars, so I made the hard decision to bow out and to not take work that others needed more than I. Not every messenger appreciates the job as much as Day and I did. For many it is a last resort, a refuge for "the forgotten, people who have fallen through the cracks of the system." It is akin to "running away to sea, or joining the circus." Being on a lower rung of the societal order may be an act of rebellion for some, but it can also be a heavy burden. It is a dangerous job, but Day's experience in London was similar to mine in Chicago--we both knew more messengers who committed suicide than who were killed on the job. Day doesn't say in so many words that he misses the job, just that he still dreams about it. He's not old enough, just 32, to call it the best job he ever had, as many do, including the New York Bike Snob, but it's not likely that he could say of any other job he's had, that he has loved every moment of it. We can thank him for taking the time to write this ode, but it is hard not to feel a little sad that he couldn't remain true to his love.